Our members were in Bangalore during a meeting with demonstration of the Bangalore Sogetsu chapter. Keith has posted some lovely photos of the North American Sogetsu exhibition. This picture is "the arrangement that the Iemoto of the school and her assistants made for the lobby of the hotel hosting the seminar", according to Keith. They see beauty even in dry leaves and driftwood. In a discarded bouquet, they see a treasure trove of possibilities. For the members of the Chennai Sogetsu Study Circle, anything in nature has charm and is to be treated with respect. A sentiment which is reflected in the art they strive to master — ikebana or the Japanese art of flower arrangement. Ikebana has many schools, the oldest being Ikenobo. The Sogestsu school was founded by Sofu Teshigahara, who recognised it as a creative art. And it is to this school that the members of this Circle belong. Malathi became interested in the art when she moved to New Delhi. “There was an ikebana exhibition in a hotel and I was struck by its beauty,” she says. From 1972 to 1975 she learnt the art and received her teacher’s certificate. “When I moved to Chennai in 1976, I began teaching it at home, and the circle grew,” says Malathi. Vaishali Vasa learnt the art while she lived in Japan. “Once I came back I wanted to continue learning and joined the circle,” she says. 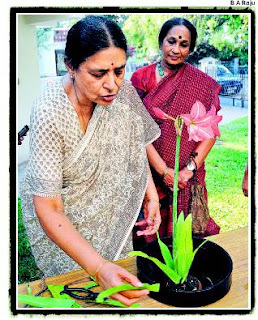 “In a tropical climate like Chennai, we use more leaves and fewer flowers,” says Molly Cherian, also a teacher. You’re encouraged to use whatever grows around you. Water is an integral part of every composition, as all life flows from water. The container plays an equally important role. The circle has conducted many exhibitions in the city. “We usually organise them from December to February as the weather is cooler and you also get more flowers,” says Trishla Vaishnav. Though she has got Meenu's name wrong, its a well written article is it not? (Meenakshi Savi is actually Meenakshi Sarin). So ladies and gentleman are we off to Japan or what? !